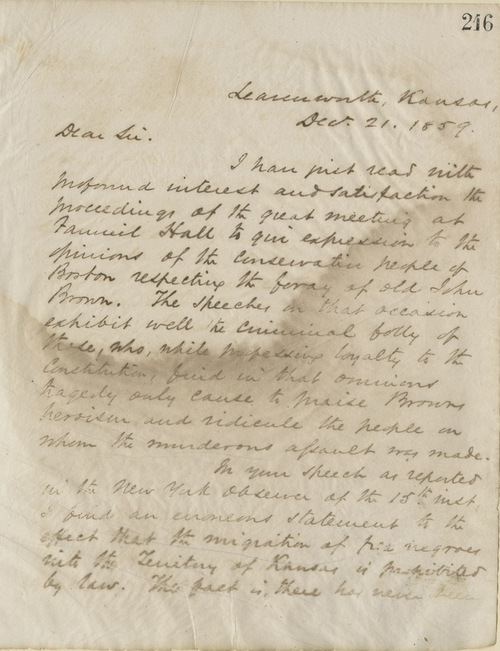 In the wake of John Brown's execution, Ewing wrote to congratulate the renowned Whig congressman, governor, and U.S. senator from Massachusetts, Edward Everett, for the sentiments expressed by Everett and others at "the great meeting at Fanueil Hall to give expression to the opinion of the conservative people of Boston respecting the foray of old John Brown." Nevertheless, Ewing had to point out "an erroneous statement" in Everett's speech "to the effect that the migration of free negroes into the Territory of Kansas is prohibited by law." This of course was not the case and Ewing believed to say so did disservice to the people of Kansas, "who, after achieving their own liberties . . . Have not disgraced themselves by denying the freedom of the Territory to any human being."